Hi all you WIPpeteers! It’s that time of the week when we share a snippet of our current work in progress. For my contribution I’m sharing an excerpt from an earlier part of my WIP Reunion. So we’re travelling back in time a little to an earlier scene where my MC Anna and her best friend Melissa have gone to the school reunion. They’ve just seen their old friends Lizzie and Rachel who they fell out with (over a boy, what else?) and who they haven’t seen since they left school. ‘Anna!’ She turned to see Lizzie and Rachel standing there. Melissa had turned around too and for a moment the four school friends said nothing, just remained standing there staring at each other. Anna’s old friends still looked much the same, but a little older. They were every bit as beautiful and stylish as when they were at school together. Both of them were tall and slim, but where Lizzie was fair, Rachel was dark. Lizzie had her beautiful blonde hair arranged in a half up half down style, with wisps gently clinging to her face. Rachel’s hair was the opposite. Her hair was so dark it was almost black, but where once it was long, hanging down her back, now it was cut into a chic bob. Anna recalled her envy of them when they were here at Mayfield Secondary together. She had often felt how unattractive she was compared with these two statuesque beauties. ‘You’re looking well, Anna,’ Rachel said. ‘She means you look beautiful,’ Lizzie said. Rachel rolled her eyes. Anna swallowed a laugh. 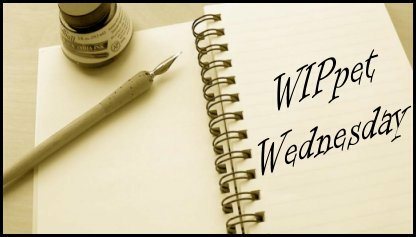 If you would like to get involved with WIPpet Wednesday all you have to do is post an excerpt of whatever you’re working on writing-wise on your blog. The only rule is that it has to relate in some way to the date. You can be creative like me and use a bit of maths to help it all fit. Or do something simpler like 7 paragraphs from chapter 8. Then add your name to this linky. Thank yous go to the lovely K.L. Schwengel for hosting. Next ›The Inheritance is coming! Is Lizzie being snipey? Or is Rachel with the eye rolling? Great personalities coming through in this writing! Thanks Adrian. This scene is an important one, the main reason being that the friends are reunited for the first time in years after a major falling out. That sends a shiver through me meeting the popular, beautiful girls at a school reunion *shudder*. Sounds like both Rachel and Lizzie are making a snide remark about Anna? Neat descriptions of the two women. Thanks Kate. As I said to Kathi, maybe I’ve written this a little wrong because Rachel and Lizzie are actually being sincere, although Lizzie is being blunt when she says ‘she means you look beautiful.’ Lizzie does tend to say what she thinks. Rachel means what she says. Anna, Melissa, Rachel and Lizzie were all friends at school until they had a major falling out. And I do know what you mean about popular, beautiful girls!! Ooo… tension! It’s so interesting to me how much nervousness some people express when they’re meeting someone they haven’t seen in, what? 10 years, probably? I guess some hurts/longings die hard. Yes I’d definitely feel that nervousness. A year or two back I got invited to a school reunion but I chose not to go as I was so unhappy at school and didn’t get on with some of the other girls. So in a way I’m kind of living through my characters, having them meet people from their past and it going well. He was that. 🙂 Most notably, he got rid of a lot of u’s (color vs colour, etc.). He wasn’t consistent in his changes, though. You mentioned you had trouble with bullies as well. It sounds like, do you call it secondary school, in the UK? didn’t go very well for you. It’s kind of nifty that you’re using your characters to make things better, in a sense. 🙂 Do you think there might come a time when you would feel comfortable meeting some of your old school mates again? That is interesting. I guess he wanted to make his mark and maybe help to create American English, to distinguish it from ‘English’ English if you like! That was part of it. I don’t know how UK phonics are taught, but you can’t apply US phonics and get the same word in many cases. (Worcesteshire, for example. I’m told UK pronounces it woo-ster-shire whereas we say work/wers-es-ter-shire.) The other part had more to do with some letters being more or less unnecessary, as he saw it, because they were carry-overs from the ancient languages that influenced modern English and no longer represented the sounds they originally indicated. I always think it’s daft the way that in the UK we pronounce it :’Woo-ster-shire’. And then there’s the county below it which is spelled ‘Gloucestershire’ but pronounced ‘Glo-ster-shire’. Languages and pronunciations are funny things. I think in many ways you Americans are more sensible in the way you spell words – words you mentioned like ‘color’ v ‘colour’ or another one ‘gray’ v ‘grey’. Well, you guys do get first dibs on correct pronunciation. I did some research on linguistics a few years ago for a novel I wrote. Since English doesn’t have a single university dictating the rules (like Spanish), anything goes. Literally. Even standard English changes rapidly. I hadn’t thought of it like that, but yes I guess in some ways I am trying to make things better by having my characters experience a better time than I had. I think the main way I’d like to be more like my characters is to be better at sticking up for myself, more assertive etc. I’m not sure I ever really would want to see the people I was at school with again. It’s all water under the bridge anyway and seeing them again might make me feel bad. Although I would like to see the girl I was best friends with for a while. It’s been years. Ah. I love reunion scenes! Yes, great description. I had the same question as Kathi, but your explanation helps. I didn’t see your comment before L. Marie but thank you very much! I’m glad I read the comments before commenting, Elaine (though I agree with Kathi that changing things based on commentary in a WIPpet is probably not necessary… I would make a small note of the comments for checking later in context). Yeah it is somewhat awkward. They had a bad falling out over a boy at school and took sides – two against two. It’s only now that they’re able to break the ice. Every school has those couple of perfect people in its ranks, doesn’t it? I’m not sure I would like to run into the ones from my class again. The awkwardness of running into them really comes across here. Yes schools do have their perfect people. Anna and her best friend Melissa are actually making up with Lizzie and Rachel at this point, not having seen each other since their schooldays. There’s been a lot of heartache, especially for Anna but here Lizzie and Rachel are full of remorse for what happened and the decisions they made. I don’t think school’s an easy time for anyone, especially not when you’re a teenager. I’ve skimmed the comments and, remember don’t change it based solely on a snippet, but I have to say that I agree the meeting seems not a happy one in a bad way. There are unhappy ways in different styles, like anxious or nervous or uncertain which aren’t bad because they can end up turning happy. But, this doesn’t seem like it will end good. I’m personally not into reunions. So, I can’t relate.